I knew David Sedaris’s The Santaland Diaries wasn’t your typical jingle bells and fa-la-la. 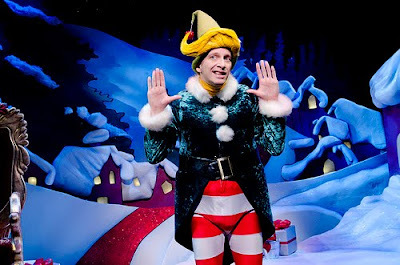 I’d heard the sardonic NPR performance years ago, based on Sedaris’s true experience as a guy down on his luck who hires on as a Christmas Elf at Macy’s. And so I was excited about the Portland Center Stage production, adapted for the stage by Joe Mantello (playing through December 31). But when Jim Lichtscheidl walked on the bare stage as a plain, ordinary guy droning with disdain, I was a little less excited. Without David Sedaris’s delightful squeakiness, the sarcasm seemed empty. The audience in the Ellyn Bye studio seemed somber, too, at first. Then I found myself chuckling. By the time our hero donned his pathetic elf-suit and puke-yellow hat, the audience was whooping with delight. What unfolded was a 3D encounter with all the wit of Sedaris’s story. A sparkly Santaland appeared with crunchy glitter and top-heavy ice-cream roofs. Lichtscheidl took on dozens of characters with aplomb. As Crumpet the Elf he pranced nimbly about like a crazed windup toy. There was an amazing bit where he became a spoiled kid throwing a tantrum. And then, in a blood-red haze, he was a prophet of doom, booming out about the evils of SatanLand. Suddenly we, the audience, know why we are here. It is our chance to vent. We can ridicule the worst in people, their greed and impatience. We can acknowledge all the things we hate about Christmas. But the ugly side of Christmas isn’t just in other people. It’s in us, too. “All I do is lie,” complains Crumpet. Sure, the management put him up to it. But don’t we always have some excuse or other about why we’re cheating, grabbing, rushing, behaving less than our best? And doesn’t the notion that you deserve something special bring out the worst in you? Laughing with The Santaland Diaries gives us a chance to rethink ourselves. By the time we’ve exhausted our cynicism and tickled our funnybone, we want to live differently. We are weary of perfect Santa-lap scenarios. We’re ready to pay attention to what we’re doing, and ask why we’re doing it. Crumpet tells us the quiet story of one store Santa who made sense. “Remember the most important thing,” Santa told Crumpet. Take a cue from the big guy. Think about what’s really important to you this holiday. And give some credit to the little helper in the puke-yellow hat. I love this post! The Santaland Diaries is one of my annual holiday favorites -- the book, I mean, so I should check out the stage version. Thanks, Monique! Would be great to run into you at PCS, anytime. Thanks for sharing about this. Would love to see it and sounds wonderful! Hope your holidays sparkle with the magic you deserve!